Once UAI comes online, a lot of weapons will be integrated on an as-needed basis and be completely separate from Block upgrades. 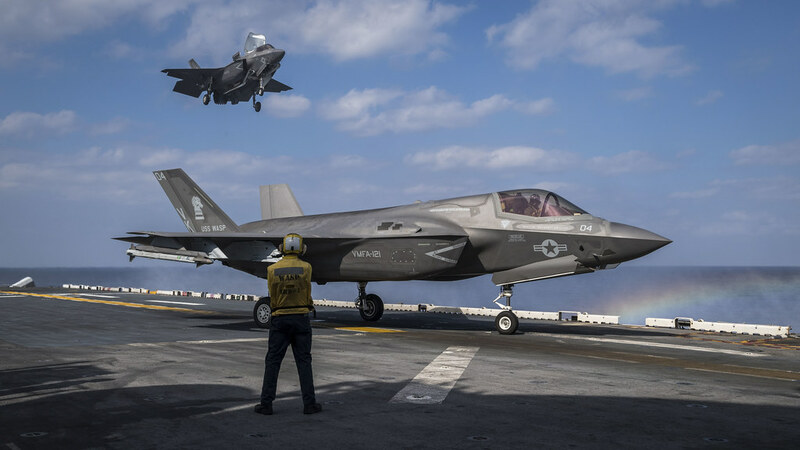 ...While aboard Sawyer and Yamashita met with Wasp ARG leaders, received briefs about amphibious capabilities and observed flight operations by 31st MEU F-35B Lightning II aircraft...."
Rinji F-35A Hikoutai, JASDF, based at Misawa AB, Aomori Prefecture. 15:35, landed, at Misawa AB. Departed from Komaki AB, Aichi Prefecture. 12th of 12 F-35A for current fiscal year. JASDF will soon rename "Rinji F-35A Hikoutai" [Temporary F-35A Squadron] to "302nd Hikoutai" [302nd Squadron]. Previous schedule, fiscal year 2019, six F-35A would allocate Misawa AB. Two of the six assembled ahead schedule. 2018 December, first of the two allocated Misawa AB. #712 is second of the two. Current schedule, by fiscal year 2020, total 22 F-35A would allocate Misawa AB, as two squadrons. Amazing to see the impact Japanese F-35's will have in the region. Before its arrival, China's air force could have been considered vastly superior, especially in numbers. It's J-10's, J-11's and now SU-35's would be more than a match for Japanese F-15's and F-2's. But with the F-35, China has to deal with an aircraft that can quite handily dispatch with their various Flanker derivatives and J-10's. The rather large fuel tank of the F-35 gives it an outstanding range advantage around that region. Its range and superior sensors and fusion systems (and room for expansion and improvement) will make this a great Japanese asset for many years to come. Why Japan did not push for the F-16 XL version (with even more fuel) will stay an open question forever. I would say that the Japanese already done something similar along those lines with the Mitsubishi F-2 which is basically a bigger F-16 with more internal fuel (and certainly more range). vilters wrote: The rather large fuel tank of the F-35 gives it an outstanding range advantage around that region. On the internal fuel, I could only find "increased by 82%". So.... circa 14,000lbs? (Math isn't a strong point). That would be around what an F-15C carries, but with a single engine. Beautiful aircraft, and futuristic looking - even today IMO. "Any similarity to actual events or persons, living or dead, is purely coincidental. " "WASHINGTON -- The recent crash of an F-35A stealth fighter jet will not stop Tokyo's plans to buy more of the aircraft, which is crucial to strengthening defense capabilities and maintaining a strong relationship with its ally, the U.S., Japan's defense minister said after meeting his American counterpart. ...Japan has received 13 F-35As so far, of which four were built in the U.S. and the rest assembled in Japan from American components. The government plans to procure six more this fiscal year. Going forward, Tokyo will stick to importing finished jets, as it is more cost-effective. Though Japan's Self-Defense Forces have yet to put F-35s into active service, Tokyo hopes that adding U.S.-made planes to the fleet will help it serve as a greater deterrent, especially given the jet's capability to be equipped with advanced interceptor missiles that could potentially destroy ballistic missiles in midair. ...The U.S. has not disclosed details of the F-35's state-of-the-art technology to other countries, and there are worries that China or Russia could get their hands on the wreckage and unlock some of its secrets, including the jet's capability to shoot down ballistic missiles. This is among the reasons why Washington is sending a deep-sea search vessel to the site of the incident to help find the wreckage.